So if you are anything like me, you are addicted to the adorable erasers from the Target Dollar Spot! They make the most perfect math manipulatives for my students. Target currently has snowmen, tree, and penguin erasers in the Dollar Spot. I picked up a few bags of each and created a Winter Race Math Game. This game will have your students spinning and counting to see which eraser makes it to the top first! It is the perfect match to the Fall Race Math Game. These are the erasers that I picked up from Target. They are super cute and festive! For this game students spin the snowman, tree, and penguin spinner using the paper clip and pencil. To spin, they just put the pencil inside the paper clip and put the pencil point on the dot in the middle of the spinner. They give the paper clip a flick to spin it. When the spinner stops, students mark that same spot on the graph using their manipulative. Students continue spinning until one of the winter erasers reach the top first. Some of the ways I like to have my students talk about math while playing this game are: *Counting how many of each eraser they have collected *Counting how many more to reach the top *Counting which has more/less There are a lot of opportunities for students to discuss math within this simple and fun activity. This game can easily be played independently or with a partner and would make a great addition to a math station in your classroom. Ready for some Winter Race math fun?! Just click the image below to grab your FREE download! But that's not all!!! 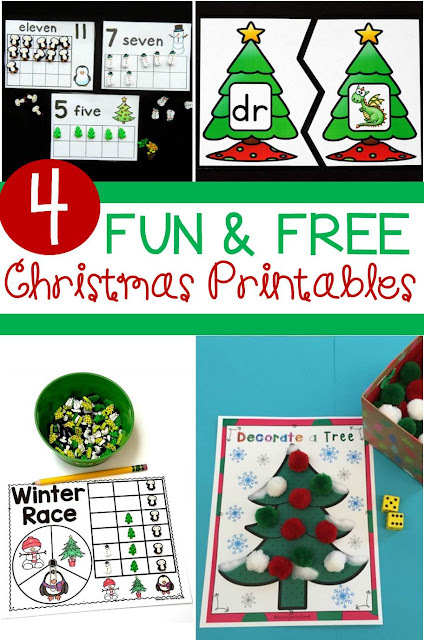 I've teamed up with some of my favorite blogging friends and we are all sharing a Christmas Themed Activity with you! Hop on over to their blogs to check out their FREE download! Have the Target Christmas erasers? Have fun counting to 20 with these Christmas Eraser Counting Cards from The Kindergarten Connection. Have a blast with blends with these Christmas Tree Blends Puzzles from A Dab of Glue Will Do. Don't put those erasers away yet! 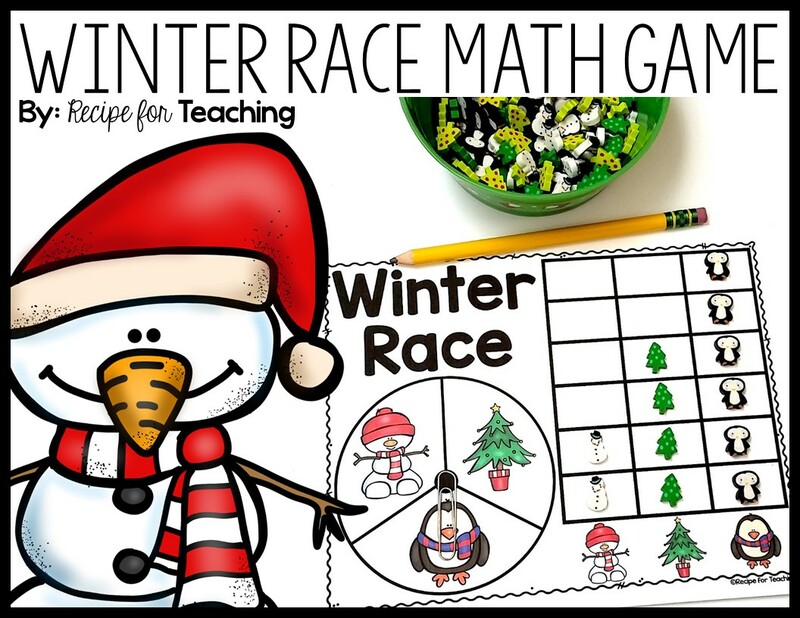 Spin and graph with this fun Winter Race game from Recipe for Teaching.